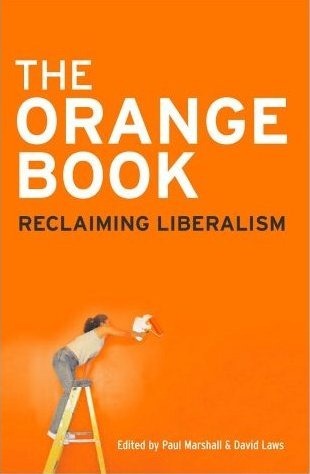 I suspect most people will see me as an "Orange Book" Liberal Democrat, so I thought I should read the eponymous "The Orange Book: Reclaiming Liberalism" edited by Paul Marshall and David Laws. The Orange Book was first published in 2004, when Charles Kennedy was leader of the Liberal Democrats. He contributes a foreword which is fully supportive of the Liberal inheritance but a little guarded on the policies proposed. The book was written at a time when Labour had been in government for 7 years, the start of the Iraq War was one year past and the economic outlook was fair. The contributors include Nick Clegg (an MEP at the time), Vince Cable, David Laws, Ed Davey, Chris Huhne, Susan Kramer, Mark Oaten, Steve Webb, Jo Holland and Paul Marshall. The essays cover Liberalism, localism, Europe, global governance, economics and social justice, the environment, the health service, crime, family policy and pension reform. The value of the essay over a news presentation of policy is that the proposals are preceded with some sort of background indicating how they were motivated; as a consequence I found The Orange Book rather more interesting reading than I was expecting. The book starts with an essay by David Laws on the Liberal inheritance; decomposing it into the personal (to do with individual freedoms), political (devolution and Europe), economic (free trade and controlling state as well as private monopolies), social liberalism (welfare and health by consumer power). Along with Paul Marshall in the introduction he has some harsh words for socialism. Ed Davey’s piece on localism and Nick Clegg’s on Europe fit well together: envisaging respectively dissociation of power from Westminster to local councils and Europe. I commented after the election that an accommodation with the Tories over Europe was not as surprising as many people had thought; the seeds of this can be seen in Nick Clegg’s chapter where he advocates abolition of the Common Agricultural Policy and repatriation of the powers that led to the social chapter and much of the regional support mechanism leaving behind only those components that provide inter-country benefits and support for regions whose governments could not provide support themselves. Somewhat less comfortable an idea for Tories will be more foreign and immigration and asylum policy being handled at the European level. Clegg also provides a catchy headline to keep the EU in proportion: it has a budget of 1% of European GDP and a civil service the size of Birmingham City Council. Ed Davey’s piece on localism (devolving power to local councils) is well-established Liberal Democrat policy, and looks to more control by local democratic institutions rather than central government. A benefit of this approach is that services can be crafted to local needs rather than a central blueprint, furthermore it allows for more experimentation at smaller scale as to how to best deliver services. To enable this shift there needs to be improvement in the accountability of local councils, with the ending of local one-party states through fairer votes. For reasons I can’t quite fathom the chapters on global governance, liberal economics and social justice, and the environment passed me by without making a great deal of impact. Mark Oaten’s headline of Tough Liberalism regarding crime seems a little out of place since the emphasis of his piece is on education within the prison system and seeing the process of release of prisoners into the community at the end of their sentences as a “settlement” not “re-settlement” since many prisoners have never had settled lives to return to. David Laws’ second chapter is on the health service: it outlines the flaws of the NHS, what the goals should be for the health service and proposes a solution. He sees a scheme of simply boosting funding through the current mechanism as being a short-term solution – easily susceptible to future unravelling. Perhaps it will be a surprise to many that he sees one of the problems with the NHS that its cost control is too effective, referencing the phenomenally high bed occupancy rate which leads to longer waiting times. His proposal is for a National Health Insurance Scheme with the NHS as one potential supplier of care with providers only able to offer non-clinical services as top-up to the national insurance specified clinical services. This scheme is based on those found in other European countries. The chapter by Steve Webb and Jo Holland on family policy seems a little more interventionist than might be considered Liberal with an apparent enthusiasm for encouraging marriage rather than partnership. However, one welcome idea is to scrap a target for getting 70% of single parents into work. This attitude has always struck me as a bit jarring: that work is so important that the State will encourage you to work whilst paying someone else for the work of raising your children. The book finishes with a chapter on pensions, a subject close to my heart at the moment. Liberals have been at the heart of pensions from their inception in the UK with Lloyd George and later in the Beveridge Report implemented by Labour in the post-war government. The problem with pensions is that since Beveridge, in the 1940s, things have changed a lot. The original pension scheme is pay-as-you-go: current payers of National Insurance pay for current claimants. No-one is contributing to their own state pension. At the time of its foundation in 1948 this scheme was relatively inexpensive (only £4billion per year in current terms), currently the state pension costs £40billion per year – due to a larger retired population relative to those working. For this reason the value of the state pension has fallen over the years since there is not the political will to lift current contributions to match the original commitment. Marshall proposes a compulsory funded pension to supplement the current system. The funding system at least forces the government to be explicit about their liabilities in pensions. Over the next 20 years or so the pensions problem will become more acute: currently the dependency ratio (the ratio of those in retirement to those in work) is 0.3 by 2030 it will be 0.4. Regardless of whether you agree or disagree with the policies presented this is the type of policy discussion I expect to see taking place in my party. The "Orange Book" label feels more like an attempt to personalise a division between old-style Liberals and social democrats, and to cut off the Liberals from a Liberal past rather than any useful description of political thought. It also has the air of being more about Coalition with the Tories rather than any differences in policy.